International Journal of Research in Health Sciences,2014,2,4,1170-1173. 1M.D( Obstetrics & Gynecology), FICOG, FMAS, Medical Superintendant, Associate Professor & HOU Obstetrics & Gynecology, Department, Cama & Albless Hospital, Grant Government Medical College & Sir J. J. Group of Hospitals, Mumbai, Maharashtra, INDIA. 2MS(OBGY), Assistant Professor, Sir JJ Group Of Hospitals and Grant Government Medical College, Mumbai, Maharashtra, INDIA. Introduction: Ruptured ovarian mimicking an acute abdomen is uncommon. Paraovarian cysts (POC) represent approximately 10% of adnexal masses. Its incidence is estimated at 1 in 1,500,000. Ovarian torsion accounts for about 3% of gynecologic emergencies. It is difficult to differentiate a paraovarian cyst from an ovarian cyst by radiological imaging. 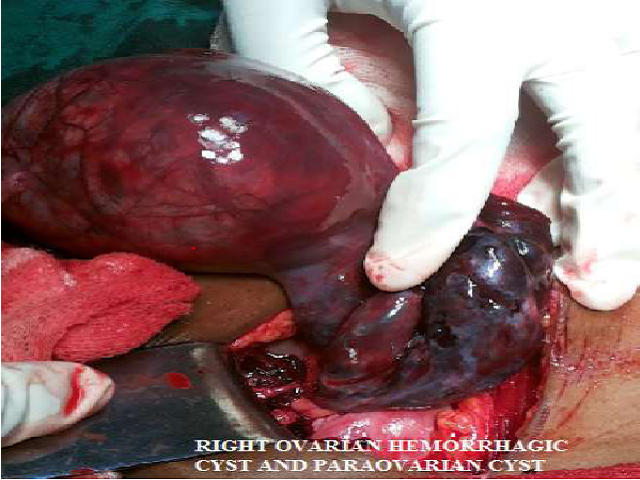 Case Report: We are hereby presenting a rare case of torsion and rupture of a hugeovarain cyst with ipsilateralparaovarian cyst with haemoperitoneum presenting as acute abdomen. Exploratory laprotomy with salpingo-opherectomy was done. Patient was discharged in a healthy condition. Discussion: Rupture of a paraovarian cyst with torsion presenting as acute abdomen is extremely rare. The lack of specificity of the clinical signs and symptoms and the numerous pathologic findings in the pelvis and lower abdomen often fail to alert the physician to the condition, making diagnosis difficult. Such patients should be subjected to immediate surgical intervention in order to save the life of the patient. Conclusion: One should keep in mind a differential of torsion of a cyst in a patient presenting with acute abdominal pain. Timely expert surgical intervention is required in such cases. This rare case is one example.